My neighbors Laurie Carlson and Bill Voedisch who live near Marine on St. Croix discovered what they thought was a dead bird outside their horse barn in March. But when they picked up the robin-sized bird its eyes popped open. 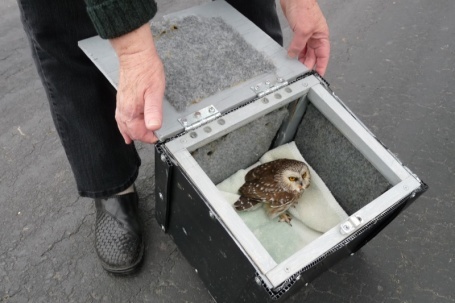 Recognizing it as one of our smallest raptors, a Northern Saw-Whet owl, they quickly wrapped the injured bird in a towel and took it to the Raptor Center on the University of Minnesota's St. Paul campus. 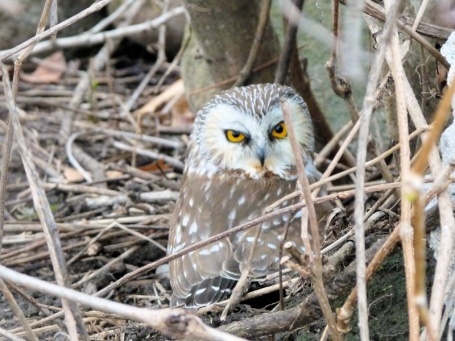 Clinicians at the Center discovered the owl had scratched an eye and torn an eye lid, likely during one of its nocturnal hunts, and was severely under nourished. Surgery was performed on the eye lid and the corneal abrasion was treated. A month of nourishment and rest was prescribed. ...as if to, at least briefly, say thanks to its rescuers. Few people ever get the opportunity to see a Saw-Whet because they are quite shy and strictly nocturnal. They are far from rare in rural Washington County, simply rarely seen.